There are different kinds of contemporaries. There are the super-cute, feel-good ones like Anna and the French Kiss, and the cute yet a bit more serious ones like Sarah Dessen's books. And then there are the contemporary that, while they have feels and great moments, are a lot more serious than cute, like Holly Cupula's Don't Breathe A Word. (And they're all good, just different levels.) I'd say that Wild Awake falls under the latter category, with characters going through rough patches, excellent touches of romance, and gorgeous writing. I did have a few issues with the book. Some things weren't elaborated on when I thought they should have been. For instance (minor spoilers here), the pot smoking. I don't get how Lukas's parents can't tell that the two teens are high, or that they're smoking weed in the basement. (They should at least be able to smell it, and they don't seem like the kind of parents who would support teenagers smoking weed.) Some things--like that--just seemed too unrealistic. Like the romance, which seemed a little rushed (like, come on, you just met the guy in the middle of the night outside a club). However, I still loved it. There were a few repeated words and phrases, but none that were super noticeable. A few parts with Kiri--the MC and POV--confused me; she acted kind of crazy. And the ending, while I liked it, didn't quite tie everything up enough for me. I wanted to know more about certain things. That said, while I didn't love Wild Awake, it was a good book. It's a gritty contemporary that's not just about a boy and a girl liking each other--it takes on life issues, mental illness, and murder. It deals with the loss of a sister and feeling like you have to be the best and a certain person to the family--even if that's not quite who you want to be. It's serious, but the writing and Kiri's voice helped lighten it up so it's not some dark and depressing novel. Speaking of the writing--dang. It was simple and very readable and easy to breeze through, but it had an added touch and spark. Like every other sentence had a metaphor or simile and they were great. It was like Art, metaphor-writing style. And I really, really liked it. I want to read more from Hilary and she how she can twist and contort twenty-six letters. And to add on to the art--the paintings described. There were two certain paintings mentioned, and I really, really want to paint them myself. I kind of love the quotes on them. "I feel exposed, like an inventor whose secret workshop has just been raided by the CIA. I'm a trapdoor spider whose trapdoor has been pried open. I'm a fetal pig pulled from its bucket of brine, my inner workings sliced open for all to see." "People are like cities: We all have alleys and gardens and secret rooftops and places where daisies sprout between sidewalk cracks, but most of the time all we let each other see is a postcard glimpse of a skyline or a polished square. Love lets you find those hidden places in another person, even the ones they didn't know were there, even the ones they wouldn't have thought to call beautiful themselves." I liked most of the other characters, for the most part. Lukas and his parents were fine and served their purpose. Sukey was a way to show the past, and how much Kiri changes and has changed, and how much Kiri is like her older sister. I didn't mind Denny, though he was kind of a pain in the rear. The parental units seemed kind of clueless and didn't like to deal with their children's issues. Aunt Martine was kind of, well, a b-word. And I think Dr. Scaliteri and Nelson Chow were meant to be disliked, because I wasn't their biggest fan. I loved Doug and his cat. He's an alcoholic on crutches who kind of seems like a bum, but he was a great addition to this wild story. Doug was just super entertaining, and a way for Kiri to connect with Sukey. "I feel like a tire rolling down a hill, heavy and fast and completely indestructible, and if there was ever a point when I could have slowed down, that point is teensy tiny far behind me now." Then there's Skunk. Yes, Skunk. A guy who seems to not care and be a tough guy at first, but ends up being just as crazy as his Crazy Girl. Bicycle Boy--one of his nicknames--is a "brontosaurus of love," an artsy-esque guy who lives in a radio temple and likes to fix bikes. He turned out to be nothing like I thought he would when he was first introduced, and I kind of love him. He's got some serious issues of his own, but together, he and Kiri fix each other while simultaneously making them both more crazy. Skunk was such an odd character, but in a good way. I don't know that I've met a guy like him in YA, but I liked him. I really, really liked him. "The universe, I realize, is full of little torches. Sometimes, for some reason, it's your turn to carry one out of the fire--because the world needed it, or your family needed it, or you needed it to keep your soul from twisting into a shape that's entirely wrong." As I reached the last pages of Wild Awake, I felt the space between my current page and the back cover getting more and more thin. I kept thinking "no, no, there must be more, don't be ever yet." Then I finished it, and my head was all "that's it?!" It wasn't a bad way to end the book at all; I just wanted more. It was a little too open-ended for my taste, but it wasn't a bad ending. 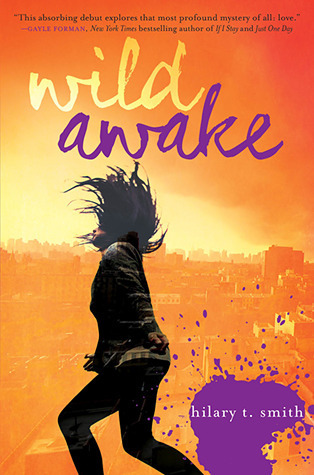 In the end, no summaries I've seen of Wild Awake accurately describe the book, in my opinion. They don't mention the magical wording or how unique the romance is or how beautifully messed-up the characters are or how oddly they act. It really is a contemporary that's different from others out there. It's kind of a mystery: What the hell is up with Kiri? A brontosaurus of wildness, Wild Awake just may fill you with love, bison-style. Would I reread it? I wouldn't say never. Would I purchase it? Yes. I like the sound of this contemporary-that's my genre and I've been eager to try it out after loving the bright cover. I'm really not sure about the pot smoking and the rushed romance (meeting outside a club sounds a bit sketchy) but at least now I'm prepared for when I pick this book.